Apologies for the lack of the update. Spent the last week catching up on some much needed rest, spending time with my family and also finally making some changes to the blog layout. The layout is pretty much done, just some minor stuff which I need to get it out of the way which I hope I will be able to get it done soon. 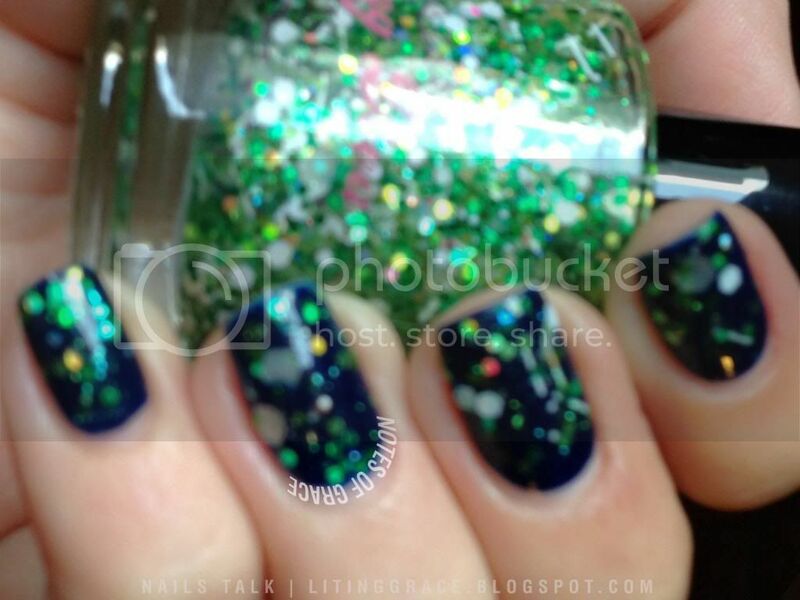 For today's Nails Talk, I have another indie polish brand that's new to the blog. 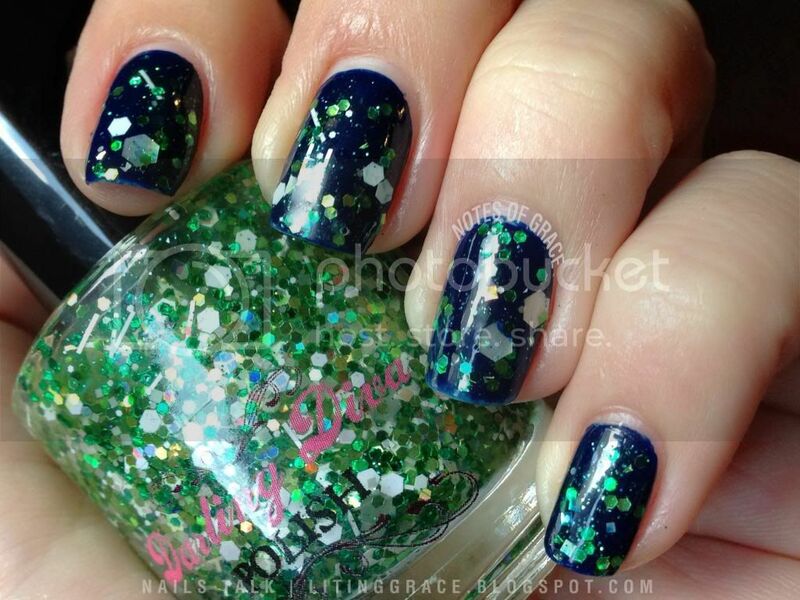 Bonnie Lassie (BL) is part of Darling Diva Polish's St Patrick's Day collection.It's describe as a "clear glitter topcoat with holographic green glitters mixed with white glitters and white bars with green shimmers". Truth to be told, I'm not really a lover of green glitters but this green beauty with its holographic and iridescent glitters has changed that! It looks beautiful not only in the bottle but in real life too. 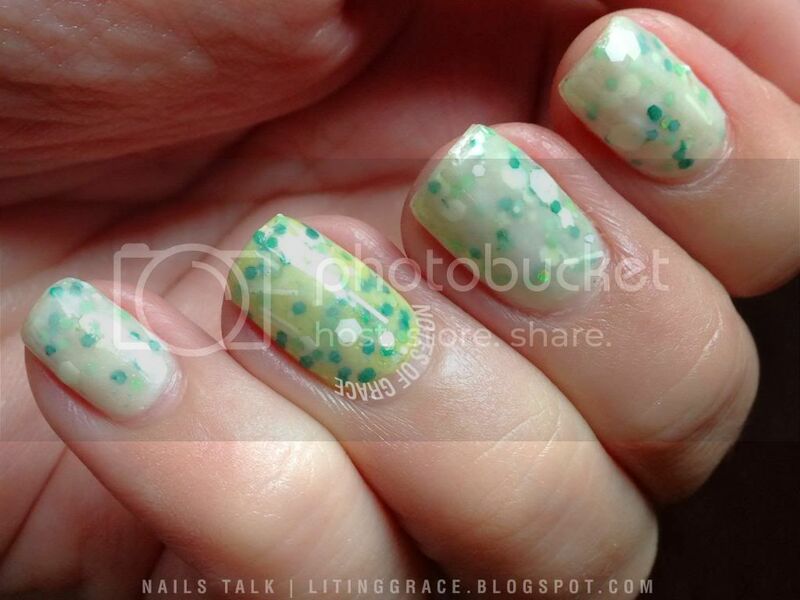 Remember my previous post for the #SGSwatchFest Spring theme mani? 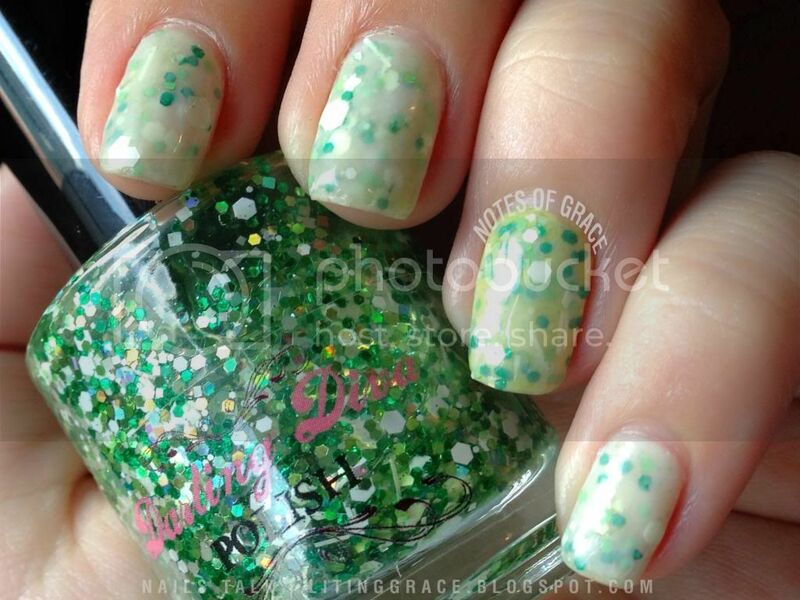 The green glitters used to mimic the spring grass was created with this particular polish and I received many compliments for that particular set of mani as well. Since I loved this beauty so much, I decided to create two different looks for this post. For the first set, I layered one coat of Bonnie Lassie over two coats of Cult Nails Time Traveler. I really love the contrast of the green glitters against the dark base, so much that I couldn't bear to remove it. And here's a blurred shot to show the beautiful holographic flashes. Being the jelly sandwich nails lover that I am, I decided to do that for the second look. For the thumb (not shown here), index and pinky fingers, I sandwiched two coats of Bonnie Lassie over two coats of OPI Don't Touch My Tutu! (base color) and a coat of Care to Danse (top). For the ring finger, it was two coats of Bonnie Lassie over Etude House NBE101 Warning Yellow and OPI Care to Danse. Before I started using Bonnie Lassie, I was afraid that it would be a headache to apply given the huge amount of glitters but surprise, surprise! It was a breeze to apply! No fishing of glitters, not even the huge white hexes, no clumping and best of all, it wasn't a topcoat eater. 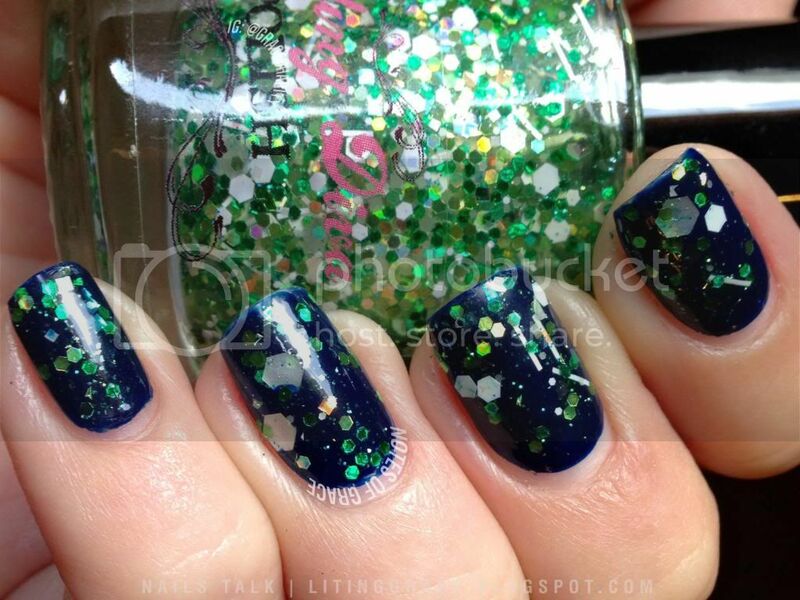 I only had to use a coat of Seche Vite top coat in the photos above. What I really loved about Bonnie Lassie is that it's really versatile. 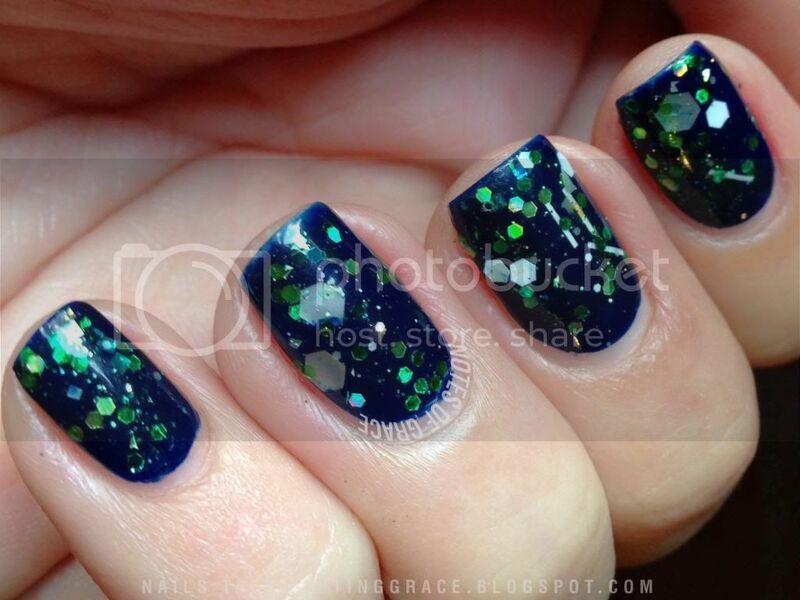 Different effects when layered over a dark or light color and looking equally good in a jelly sandwich mani. This is one glitter that I see myself using pretty often. Bonnie Lassie is retailing at SGD15.00 (inclusive of normal postage within Singapore) on Mei Mei's Signatures and the last I checked, there's one last bottle in stock. So do hurry over to Mei Mei's Signatures to snag this beauty before it gets sold out. International shipping is also available. That's all I have for Nails Talk today and I will be back pretty soon with more updates and more gorgeous polishes to share. Till the next, have a blessed day!